Major reports of election day problems with voting due to Hurricane Sandy, photo ID in Pennsylvania and broken voting machines in Ohio. I attended a briefing in Washington this morning with voting rights advocates hosted by the Election Protection Coalition, which runs the 1-866-Our-Vote hotline. They are being inundated with calls from voters. In 2008, the hotline received 100,000 calls. As of 11 this morning, they’ve already received 35,000 calls. Here are the three biggest problems the Election Protection Coalition were hearing of this morning. This list is by no means comprehensive, just a snapshot of potential election meltdowns. I’ve linked to the 866-Our-Vote page for each state below. Problem #1: Problems with voting in states hit by Hurricane Sandy, particularly in New Jersey and New York. In New Jersey, for example, servers set up to handle ballots sent via e-mail have crashed due to volume. People affected by the storm don’t know where to go to vote. Polling places are not open, or not staffed, or the voting machines aren’t working. 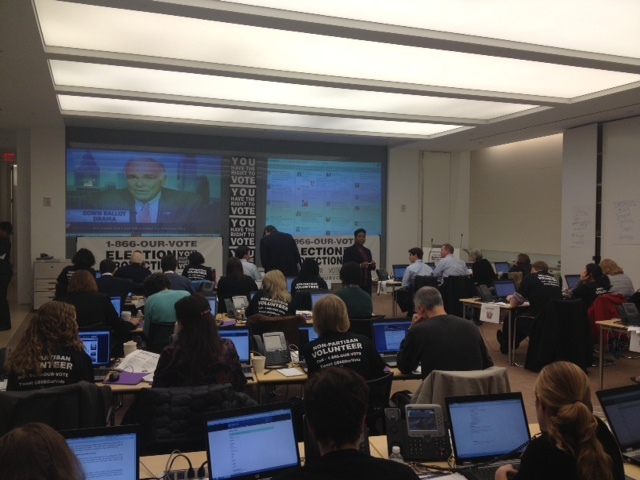 The highest concentration of calls to the 1-866-Our-Vote hotline is coming from New Jersey. Problem #2: Poll workers in Pennsylvania wrongly telling voters they need photo ID to cast a ballot. According to the law, poll workers in Pennsylvania can ask voters for ID, but they are not required to show it in order to vote. However, that is not how the law is being enforced. Eric Marshall, co-director of Election Protection, says such problems are occurring across the state, although reports are that minority voters are being targeted in Philadelphia, Pittsburgh and Harrisburg. “Poll workers are asking black voters for ID but not white voters,” Marshall reported. Problem #3: Voting machines are not working in the Ohio cities of Cleveland, Dayton and Toledo. The optical scan electronic voting machines are broken. These are heavily Democratic cities where Obama needs a big turnout to win. UPDATE: I'm told by the Election Protection Coalition that this problem has been resolved. For updated coverage of the fight against voter suppression, check out our Voting Rights Watch blog.